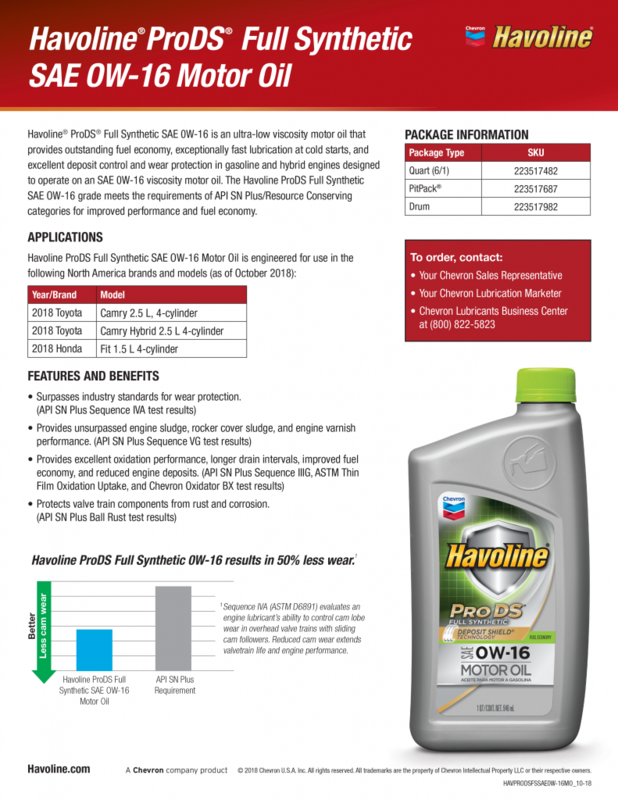 Havoline ProDS Full Synthetic SAE OW-16 is the newest ultra-low viscosity motor oil to be added to Chevrons product line. This product is for modern gasoline and hybrid vehicles, with start-stop engines that are designed to operate on SAW 01-16 viscosity motor oil. Havoline ProDS Full Synthetic SAW OW-16 provides outstanding fuel economy, exceptionally fast lubrication at cold starts, and excellent deposit control and wear protection. Not to mention, Havoline ProDS Full Synthetic SAW OW-16 meets the requirements of API SN PLUS . Brewer-Hendley Oil Company provides the best in product, service, and quality. By offering our customers leading industry products, we ensure that our customers always stay ahead of the competition. Find out more about Havoline ProDS Full Synthetic SAW OW-16 by Visiting www. BrewerHendley.com and contacting a sales rep today!